Outlook grim for construction sector after orders for private and public housing fell by almost 25% in second quarter of year. Britain’s construction industry seems set for a bleak future after orders suffered a 14% fall between April and June. The only area that recorded any growth in new orders was the private industrial sector, while orders for private and public housing plummeted by 24% and 23% respectively, according to the Office for National Statistics. Infrastructure orders such as roadbuilding were down 22%, the biggest fall since 2004. The latest construction survey from Markit/Chartered Institute for Purchasing and Supply was equally gloomy, showing growth slowing sharply in August, with housebuilding in decline. The figures come after construction output soared 8.5% in the second quarter, the best performance since 1982. But that is unlikely to be sustained as public spending cuts are expected to hit the sector hard. Several building projects have already been put on hold or scrapped since the election. Although the ONS stresses that the figures can be volatile, construction orders had held above £13bn for the previous three quarters before the sudden plunge to £11.6bn. The Sharp Project, Manchester City Council’s 200,000 sq ft not-for-profit media and creative industries centre, has attracted a Newcastle-based law firm to take space. Ward Hadaway will initially base two people from its creative industries team at the building in East Manchester. Laura Harper, partner, will work alongside a solicitor at Sharp Project and has taken occupation already. She said: “Moving here is a great opportunity for our creative industries team to be in on the ground and right in the heart of the action as the Sharp Project develops. “We pride ourselves on delivering a legal service which really talks the language of the creative community and addresses the issues which matter most to them. Being here gives us an excellent chance to be able to demonstrate that. Ward Hadaway, which also has an office in Leeds, works with technology companies, games developers, artists, advertising and design agencies, film companies, musicians and producers. Sue Woodward, project director for the Sharp Project, said: “We are creating our very own eco-system of companies here so each can support each other and grow. The Sharp Project is located at the former Sharp warehouse on Thorp Road, off Oldham Road and next to Central Park’s Gateway transport interchange. It is being refurbished at a cost of £16.5m, funded by Manchester City Council, the North West Development Agency and the European Regional Development Fund. Phase one of the project was completed in April and 25 companies have taken space. Manchester City Council has granted planning permission for a 33-storey residential tower that will provide accommodation for 520 students. Sure4orm had involvement for the interior walling, ceilings for this contract. Circa £200,000. Four-storey office building, constructed using a steel frame clad with glazing and traditional brickwork / blockwork outer walls, with stone features to the main body of the building and Ashlar stone feature to the staircores. Internal block walls were required to the lift shaft, stair cores and toilet areas. This contract was completed on time and to a high standard. Easibuild provided all supervision to this contract by regular visits from our management team and our safety officer to ensure all our quality procedures were followed. Manual Handling was highlighted as an issue prior to our commencement and appropriate systems were put in place to overcome the problem. Fire Risk Assessment Manchester was assisted by Armstrong Fire Management. Sure4orm Contracts are specialists in commercial building and maintenance sectors. 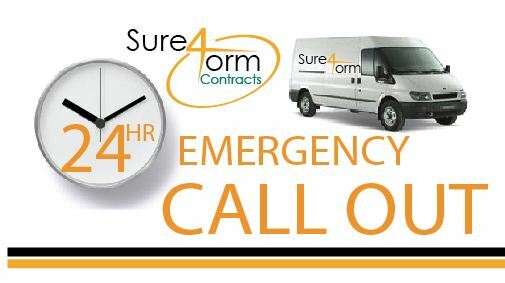 Based in Bury, Manchester we offer a 24 hour call out services for emergency requirements. At Sure4orm Contacts we cover nationally. Based in Ramsbottom, Manchester, our target areas are around the Northwest of England, but we do travel further afield should it be required. Signup now to receive a free welcome information pack. At Sure4orm Contracts we are committed to 100% customer satisfaction. Our information pack will include all you need to know about our company from health and safety documents to testimonials. Please fillout the form below with “signup” as the subject.